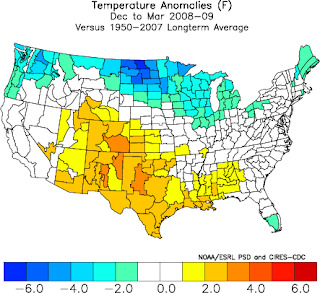 The final months of 2011 produced little in the way of weather news, but the tone for this year was set early in the year, and it was not good. One of the highest tornado death tolls in recent memory and a devastating drought in parts of the South and Southwest were the big stories of the year. But there also were memorable snowstorms in the East, Southeast and Midwest, plus major spring flooding in the Midwest and South. Summer didn't bring an end to the misery, with a 40-state heat wave in July and a hurricane that produced major flooding in late August. Five people were killed in November tornadoes in the Carolinas, pushing the twister death toll this year in the country to near 500. And the news wasn't limited to the continental United States. A storm of epic proportions hit the west coast of Alaska in November. The year started with a Greenland block -- strong high pressure over Greenland that caused a Negative Arctic Oscillation and brought repeated bouts of cold weather to the East and Midwest. Storm systems formed along the edge of the circulation flow and brought heavy snow to the East. In mid-February, the Greenland block weakened. With La Nina conditions, the persistent storm track brought several rounds of tornadoes to the South and Midwest. Summer of 2011 was extremely hot. The storm track moved a bit north, and the result was a very wet season for the eastern Great Lakes and Northeast -- and a very dry summer elsewhere. The hurricane season was, for the United States, a washout. Only one storm of note affected the country. JANUARY SNOW ... A series of snowstorms hit the eastern United States in January. The first brought snow to the Carolinas around Jan. 9, and it moved up the coast. On Jan. 11, every state except Florida had snow on the ground somewhere. Huntsville, Ala., had snow on the ground for eight straight days, setting a record. New York City and Hartford broke January snowfall records, and South Bend, Ind., set a 24-hour snowfall record with 26 inches on Jan. 8. At the tail end of the month (actually stretching to Feb. 3) came a Midwest storm. Blizzard conditions, with two feet of snow, were reported in Chicago. TORNADOES ... The jet stream set up a pattern for storms in April and May, with the track stretching from Texas across Tennessee and Kentucky. That put states from Missouri to the Carolinas in the danger zone for severe weather. A tornado outbreak in the Carolinas and elsewhere in the Southeast killed 38 people April 14-16, but that was a prelude for the worst of it -- the April 25-28 tornadoes that killed 321 people. Tuscaloosa, Ala., was among the hardest-hit cities. Another outbreak, around May 22-24, included an F5 tornado in Joplin, Mo. The death toll was 177. Then came the Nov. 16 tornadoes in the Carolinas, with three deaths in Rock Hill and two in Davidson County. Probably the biggest impact from 2011's tornadoes is a fresh look at the warning system in the United States. A National Weather Service study on the Joplin twister showed that many people did not pay attention to tornado warnings issued by the Weather Service. Emergency management officials will spend 2012 trying to determine why -- and how to change this. FLOODING ... Extremely heavy rainfall in late April and early May brought record flooding along parts of the Ohio and Mississippi rivers. The area below St. Louis, stretching down to Vicksburg, Miss., was especially hard-hit. But there also was severe flooding during the spring on the Souris River, near Minot, N.D.
JULY HEAT ... Temperatures regularly soared above 100 degrees in much of the South and Southwest, with places like Dallas and Austin shattering records for consecutive 100-degree days. Readings of 100 degrees or more were recorded in Austin and San Antonio as late as the end of September. At least 40 states reported heat wave conditions. In the Carolinas and other parts of the Southeast, the humidity was a big story. While record heat was not a problem, the high humidity kept temperatures from falling below the mid 70s many nights from late June to mid August. DROUGHT AND WILDFIRES ... The driest conditions in history were reported across all or parts of Texas, Oklahoma, Arkansas, Louisiana, Kansas, New Mexico, Arizona and Colorado. A lesser area of drought affected a corridor from Mississippi, across Alabama, Georgia and western South Carolina. As might be expected, wildfires were a huge problem. Fires caused more than $1 billion damage in Texas, New Mexico and Arizona. The Bastrop fire, about 30 miles southeast of Austin, destroyed 1,500 homes and was the worst wildfire in Texas history. ON THE OTHER HAND ... While part of the country was baking, another part was having a record wet year. Storm systems repeatedly crossed an area from Indiana, over Ohio, Pennsylvania, New York and New England. Then rain from Hurricane Irene added to the mess. The result was several episodes of flooding and some record amounts of precipitation for the year. Philadelphia had more rain this year (64 1/2 inches) than did Bangkok, Thailand (59 inches). HURRICANE IRENE ... It was the only hurricane to make landfall in the United States this year, but Irene left its mark. The storm first touched U.S. soil in North Carolina, carving a path slightly inland from the Outer Banks and causing major damage from Morehead City north to the Virginia line. Irene's approach caused hurricane warnings to be issued for New York City, for the first time in many years. But the system weakened to tropical storm status before making a second U.S. landfall on Long Island. However, heavy rain from Irene's remnants caused massive flooding in Pennsylvania, New Jersey, New York, Connecticut and Vermont. Millions of people were without power for weeks. ALASKA STORM ... The Bering Sea Superstorm of Nov. 8-9 had low pressure equal to that of a Category 3 hurricane, and it heavily damaged 40 villages and cities along Alaska's west coast. Carrying 100 mph winds, the storm created a 10-foot surge near Nome, and it produced incredible blizzard conditions with heavy snow, gigantic waves, and hurricane-force winds. Advance warning paid off, though, as only one life was claimed by the storm. Cold, snow? Where is it? Those of you clamoring for cold weather and wintry precipitation -- a group that does not include me -- are suffering through what is, for you, a nightmarish December. And it's starting to look as if the trend will carry into January. Temperatures are nearly 6 degrees above average for the month and more than 13 degrees warmer than last December. The word "snow" hasn't even been mentioned in a Piedmont forecast, and even the North Carolina mountains aren't seeing much frozen precipitation. It's been largely the same way from the eastern Great Lakes to New England. Our pattern has been consistent -- one or two days of chilly weather, followed by several days of well-above-average temperatures. Fortunately, we've had plenty of rain, so there are no worried about a drought. This has been classic La Nina conditions. We had a La Nina last winter, but from early December until mid February, we also had a powerful high pressure system over Greenland that created a "negative" Arctic oscillation and sent very cold air into the eastern United States on a repeated basis. This year, the Greenland high is not blocking mild air from the Pacific (which is what La Nina produces). As of now, there are no signs of a different pattern through the first 10 or 11 days of January. It looks as if we could get our coldest temperatures so far this winter next week. A northwest flow is expected to develop, due to a large trough over the eastern United States. "It seems cold weather is on the way next week," says Doug Outlaw, of the National Weather Service office in Greer, S.C. But the really cold air remains bottled up in the arctic, so the "cold" air that funnels down the trough into the Southeast next week won't be brutal. We're talking about a couple of days -- Tuesday and Wednesday, most likely, with highs in the mid to upper 40s and lows in the mid 20s. Then guess what? The forecast is for a warming trend, from about Jan. 7 to 11. Temperatures could reach 60 degrees again in the second week of January. As I've written several times already this season ... this pattern could change. A Greenland block could establish itself in late January or anytime in February. But we're apparently going to get through the first half of winter without much of the weather that the cold weather fans really want. 3 storms in next week; snow in the North? Get ready for a week of unsettled weather across the Charlotte region, with a chance of three separate storm systems affecting the area between now and Christmas. The last of those low pressure systems could be a snow-maker to parts of the Great Lakes, Mid-Atlantic and New England on Christmas Eve or Christmas Day. If you're planning holiday travel, you're likely to encounter rain, no matter when you hit the road (or fly) before Christmas. The situation is difficult to pin down, because the computer models are having a tough time getting the timing right. But the main thing to remember for the Carolinas is the word "mild." Unlike last year, it will be far too warm for any snowfall. The chilly weather of the past few days will transform into another round of above-average temperatures for much of this week. High temperatures will be in the 60s from Tuesday through Thursday, and it will remain in the upper 50s Friday and probably Saturday. Sunday is a bit of a question mark, because Christmas could turn out to be a chilly, rainy day. STORM #1: This is the system responsible for the blizzard warnings across parts of the Southwest and southern Plains. This storm will dump heavy snow in that area later Monday and early Tuesday, then make a run northeast. Rain will fall in most areas, for the heavy snow in parts of New Mexico, the Texas panhandle, western Oklahoma, southeast Colorado and western Kansas. This system will bring moderate rain to the Mississippi and Ohio valley areas and then into the Great Lakes later Tuesday. It will bring showers to the Charlotte region from Tuesday evening into early Wednesday afternoon. STORM #2: This will be a weaker system, coming out of Texas on Wednesday and crossing the South on Thursday and early Friday. It will produce scattered showers, including a chance of showers Thursday evening and early Friday in the Charlotte region. STORM #3: This might be the news-maker, because of the snow potential. Some computer models indicate low pressure will swing south from the Rockies, move into Texas and intensify, and then cross the Southeast and swing up the East Coast. If you're traveling Saturday, this system could bring a considerable amount of rain from Georgia up the East Coast. The highest chance of snow would be in cities like Chicago, Detroit, Cleveland, Pittsburgh and Buffalo, along with much of New York state, much of Massachusetts, western Connecticut, most of Pennsylvania except the Philadelphia area, and extreme western Maryland. The East Coast's big cities would get a cold rain. If everything develops as indicated, it could mean a rainy Christmas Day in Charlotte -- especially early in the day -- with temperatures only in the 40s. But some of the computer models are slower with this system, and some show it being weaker. Yesterday's blog entry dealt with the chances of snowfall for Christmas in various parts of the eastern United States, but there's another big question for many people ... what will travel conditions be like? Christmas isn't quite the travel holiday that Thanksgiving is, but millions of people will be flying or driving a significant distance over a period of nearly two weeks. The computer models have been hinting at the development of a big storm system next week. According to the scenario, the low pressure system would develop over Texas on Monday and then follow a path northeast, into the Great Lakes and then across northern New England. That path would mean accumulating snow in parts of Iowa, western and northern Illinois, Wisconsin, Minnesota, Michigan, New York, Vermont, New Hampshire and Maine. Tuesday and especially Wednesday would be the rough travel days, and the storm would bring heavy rain to parts of the South and the Ohio River valley. But the computers have been waffling a bit on the forecasts, so this qualifies as an "iffy" situation. So, for entertainment purposes only (we'll have a much better idea by the weekend), here is the forecast for the week leading up to Christmas, and then a few days afterward. Monday through Friday, Dec. 23: A mild week, with daytime highs from 60 to the mid 60s. Showers or a steadier rain are possible Tuesday (western Tennessee and Mississippi) and Wednesday (Carolinas, Georgia, eastern Tennessee), and another round of showers is possible on the 23rd. Christmas Eve: Sunny, with highs in the low 50s. Christmas Day: Same as Christmas Eve. Dec. 26-28: Turning colder, with highs in the 40s. Some forecasts hint at rainy conditions on the 27th (the day of the Belk Bowl) or the 28th. Monday through Friday, Dec. 23: It's a chilly week, but high temperatures are seasonal, in the 40s to near 50 (in places like St. Louis and Cincinnati). Rain spreads across the area Wednesday, and more rain is possible Friday. Snow could fall Friday in places like Milwaukee and Chicago. Christmas Eve: A rain-snow mix in the eastern Lakes and near the Ohio River, but snow could fall in places like Detroit and Chicago. High temperatures in the 30s. Christmas Day: Turning sunny but cold, with highs in the 20s (north) to mid 30s (south). Snow showers could still be possible in Cleveland, Buffalo and Pittsburgh. Dec. 26-28: Becoming clear and turning milder, with highs in the 40s by the 28th. Monday through Friday, Dec. 23: A mild week, with daytime highs in the 40s (Boston) and 50s elsewhere. But rain arrives by the 23rd. Christmas Eve: Sunny, with highs in the low 40s (mid to upper 40s in DC and Baltimore). Dec. 26-28: Cold on Dec. 26, with rain or a rain-snow mix on the 27th. Then warmer and clearing for the 28th. Monday through Friday, Dec. 23: A beautiful week, with partly sunny skies and daily highs in the mid and upper 70s. Christmas Eve: A cold front brings rain and cooler weather, with highs in the upper 60s. Christmas Day: Sunny but chilly, with highs in the 60s. Dec. 26-28: Becoming warmer, and it could reach the 80s by the 28th. Wondering about our chances of having snow for a second consecutive Christmas? Well, the Fat Lady might not be singing yet, but it doesn't look like "White Christmas" will be in her repertoire for 2011. A winter storm provided the Charlotte region with a holiday thrill last year, as several inches of snow fell over much of the area -- although much of it fell early on Dec. 26 in Charlotte. But the pattern that provided us with a brutally cold December and the white Christmas in 2010 is nowhere to be found this time around. That's the reason for our regular stretches of 60-degree-plus temperatures this December. In fact, many of Carolinas residents who travel up North for the holidays and expect to see snow might view bare ground instead this year. "Most of the Mid-Atlantic, southern New England, and the Southeast are likely out of the running for a white Christmas," says Alex Sosnowski, a meteorologist with Pennsylvania-based Accu-Weather. "There is too much mild air for snow in those areas." And if the pattern doesn't change, we might be looking at a very mild winter. La Nina conditions are present for the second straight year. La Nina (colder-than-average water temperatures in the eastern Pacific) brings mild and dry weather to the South. Cold air and storm systems typically hit the Northwest, upper Midwest, and upper Great Lakes. Last year, La Nina was overwhelmed by another condition -- the Greenland Block. That is a strong high pressure system over Greenland, and it tends to steer arctic air into the eastern United States and also into Europe. It meant the Arctic Oscillation (AO) was negative, as the upper atmospheric pattern looked like the Thunder Road roller-coaster at Carowinds. The eastern United States was at the bottom of the tracks, and the arctic air tumbled down the tracks from Eskimo country. "This year, that block is not present," says Scott Krentz, a meteorologist at the National Weather Service office in Greer, S.C. "So La Nina is a major governing factor in our weather." In addition, a strong subtropical high pressure system is establishing itself over the South. That is keeping cold air far to our north. How long will this condition last? Sosnowski, Krentz and other meteorologists don't know. Computer models only give us a two-week window into the future, but weather patterns don't tend to change in a hurry. So it might turn cold in January, but odds of an icy and snowy start to 2012 are lower than they seemed a few weeks ago. Probable: Denver, Milwaukee, Minneapolis-St. Paul, near Pittsburgh (especially east), eastern West Virginia, Buffalo, Syracuse, and inland New England. No: Charlotte and everywhere else south of the Mason-Dixon line. Much chillier air is headed for the Charlotte area, but it's the North Carolina mountains that stand to get a taste of wintry weather over the next 24 hours. A cold front is crossing the state today, pushing away the mild, moist air that has caused cloudiness and well-above-average temperatures for the last two or three days. In fact, the unofficial morning low at Charlotte/Douglas International Airport was 61 degrees, which is about 25 degrees below average. The warmest-ever low temperature for this date in Charlotte was 60 degrees, set in 1951. That reading probably won't set a record, though, because temperatures will tumble later today. However, the mild temperatures are coming to an end. Two areas of rain are crossing the Carolinas today, and the cold front will push eastward of the area by early this afternoon. Temperatures will fall from the low and mid 60s Wednesday morning to the mid 50s by late afternoon. And those readings will tumble all the way to near 30 degrees by daybreak Thursday. The cooler weather will stay through the weekend, with daily highs in the low to mid 50s, just a couple degrees below seasonal averages. In the mountains, it'll be a different story. The rain is forecast to change over to snow by this afternoon, accompanied by winds that might gust to 50 mph. No accumulations are expected in lower areas, like Asheville, but the ridge tops of the southern mountains could get an inch. And up to 4 inches could accumulate in the northern mountains. Neil Dixon, of the National Weather Service office in Greer, S.C., said the biggest problem might be black ice. Quickly falling temperatures are expected to freeze the rain that falls this morning, and snow on top of the ice could make roads quite dangerous. "Widespread black ice will create slick conditions on untreated roads, bridges and overpasses," Dixon said. The low pressure system responsible for our rain and the mountain snow is expected to dump heavy wet snow on parts of West Virginia, western Maryland and Pennsylvania. 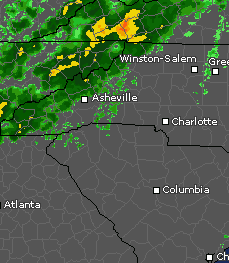 Anyone who has looked at weather radar for the last 48 hours must have thought a deluge was headed for the Charlotte area. But it hasn't happened. The area of moderate to heavy rain over the Mid-South has moved very slowly eastward since Monday, but it's about to get a little nudge, and the rain intensity will increase across the Charlotte region soon. Low pressure is expected to form along the slow-moving cold front and bring the whole system eastward later today and Wednesday. We'll still remain dry much of the time today, but shower chances will increase considerably tonight. And Wednesday will be rainy much of the time. By the time the rain ends late Wednesday night, much of the area will get about an inch. Since the growing season is over, many of us haven't been paying attention to rainfall totals, but the precipitation has been arriving at a healthy rate. Since Sept. 1, about a foot of rain has fallen in the Charlotte region. The months of September, October and November can be extremely dry some years, but we've been blessed with ample amounts of rain in autumn 2011. That will help us a lot when the 2012 growing season begins. As you might expect, our balmy temperatures will go away when the rain ends and the cold front pushes through. In fact, it'll get downright chilly in the Charlotte area from Friday into Sunday, with highs struggling to hit 50 degrees over the weekend. And a couple inches of snow are likely in the mountains. But there is nothing frigid on the horizon. Looking out two weeks, to around Dec. 19 and 20, the computer models don't show any really cold outbreaks in the Southeast. The long-range forecasts point to a continuation of what we've been seeing -- brief chilly spells, followed by a warm-up and rain. Today's the first day of meteorological winter (more about that later), and there are increasing signs that the winter of 2011-12 will be mild across the Southeast -- milder than initially thought. First, about that "start of winter." I know the official date of winter's start is Dec. 21, but meteorologists believe true seasonal weather is closer to the first days of months. So winter is Dec. 1 to Feb. 28 (or 29); spring is March 1-May 31; summer is June 1-Aug. 31; and autumn is Sept. 1-Nov. 30. Now, about the new forecast. Let's go back and review the initial prediction. Forecasters said La Nina conditions in the Pacific would mean mild and dry weather in the South, and cold and snowy conditions in the northwest and parts of the Midwest. However, meteorologists also said that if a strong high pressure system develops over Greenland -- known as the Greenland Block -- it would cause a repeat of last winter. Last year was a La Nina winter, but the Greenland Block overwhelmed La Nina and sent cold weather -- and a few winter storms -- into the Southeast and up the East Coast. Forecasters said that they weren't sure if a Greenland Block would develop again this year. So far, it hasn't. That means December will be milder than originally forecast, meteorologists say. They still aren't sure about January and early February, but they're sticking to their guns about a milder trend for latter February and March. Accu-Weather, the big private company based in State College, Pa., updated its winter weather forecast today, noting that December will be relatively mild for much of the country. Accu-Weather thinks the Carolinas will see little frozen precipitation this winter, and I've seen the same forecast from other meteorologists. Brad Panovich, the chief meteorologist at WCNC-TV, the Observer's news partner, has predicted that freezing rain -- not snow -- would be the more likely form of wintry precipitation in the Carolinas. It would seem that most of our storms will bring cold rain -- or a "close call" between rain and freezing rain. CAROLINAS ... Generally, a mild December, with a few brief cold snaps. January is a question mark, and that's when we'd stand our best chance of seeing frozen precipitation. The best guess is that if February starts cold, it will turn mild. One bad thing ... the current forecast indicates severe thunderstorms and tornadoes again will be a problem in late February and March (and probably into April) across the South. REST OF THE SOUTH ... Virginia's weather will be a slightly cooler version of ours. Southern parts of Louisiana, Mississippi, Alabama, Georgia, and South Carolina, along with all of Florida, will be mild and dry. The greatest chance of ice storms (mostly in January) will be in a band from north Texas, across Arkansas, Tennessee, northern Louisiana, northern Mississippi, northern Alabama, north Georgia, and Kentucky. The severe weather threat will grow in late winter and early spring. MID-ATLANTIC and NEW ENGLAND ... Not as harsh as last year. There will be a few major winter storms, but it will be nothing like the severe winter of 2010-11. MIDWEST, GREAT LAKES ... This will be the worst of winter. Cold weather and snowstorms are likely from the Dakotas, across Minnesota, Wisconsin, Iowa, Michigan and northern parts of Illinois, Indiana and Ohio. It could be a nasty winter for Milwaukee, Minneapolis-St. Paul, Chicago, Detroit and Cleveland. Less-frequent winter storms will impact places like St. Louis, Indianapolis and Cincinnati, where freezing rain or storms with both snow and rain are likely. The Midwest will be at the heart of the winter storm track. THE WEST ... The northwest will be colder than average, while the belt from California, across Arizona, Nevada, New Mexico and most of Texas will be mild and dry. That "dry" word is bad for drought-stricken Texas. Today marks the end of the 2011 hurricane season in the Atlantic basin, although the season really began and ended in the last week of August, when Hurricane Irene bulled up the East Coast. The National Hurricane Center says there were 19 named storms, tied for the third-highest total since record-keeping began in 1851. The NHC also says that total is well above the average of 11 and continues a trend in recent years of above-average storm activity in the Atlantic Ocean, Caribbean Sea, and Gulf of Mexico. Unless you are a fish, it didn't seem like a big season. There were seven hurricanes and three major hurricanes. Those numbers are only one above the seasonal averages. More important, only one hurricane -- Irene -- made landfall in the United States. And no major hurricane (Category 3, 4 or 5 status) hit the United States this year. That makes it the sixth straight season without landfall by a major 'cane. The last big storm to hit the mainland was Wilma, late in the 2005 season. That year also included Katrina and Rita. Irene did considerable damage to the eastern edge of North Carolina, and also in the Mid-Atlantic and New England states. It was the first hurricane to make landfall in the United States since Ike in 2008. "Irene broke the 'hurricane amnesia' that can develop when so much time lapses between landfalling storms," said Jack Hayes, director of the National Weather Service. Hayes makes a good point in noting that Hurricane Irene served as a reminder that tropical systems can strike anywhere -- in this case, Pennsylvania, New York and Connecticut took a rare hit. Irene highlighted both the good and bad of hurricane forecasting. The National Hurricane Center nailed the storm's path, several days in advance. But the intensity forecast was off, as Irene weakened before making landfall. For most of the hurricane-prone areas of the Southeast, 2011 was a quiet year, a lot like 2009 and 2010. The strong ridge of high pressure over Texas prevented tropical systems from affecting that part of the country. That prevented massive oil and gas price increases that result from a hurricane crossing the Gulf of Mexico's petroleum beds, but it also kept the Lone Star State deeply mired in an extremely damaging drought. A persistent trough of low pressure off the East Coast kept storms out at sea, much as in 2010. Look for the 2012 forecasts to start appearing in a few months. I'm starting to hear a few complaints from the winter-lovers, especially the people who are anxious to start wearing their heavier clothes and who think it's impossible to talk about Christmas when it's 70 degrees out there. I'd be happy to have 80 degrees on Christmas, but I realize my opinion is in the minority. So where is the chilly weather? First, it's not unusual to have 70-degree-plus conditions in late November. The same thing happened last year, and we had a string of near-80-degree days a few years ago around the beginning of December. Last year, the warm weather ended abruptly with a cold front that arrived late Dec. 1. From Dec. 2 until Valentine's Day, with a few exceptions, conditions in the Charlotte region were quite cold. Almost like clockwork, much cooler air is on the way. It will arrive early Tuesday, and our high temperatures for a few days will only be in the 50s. It won't be quite as brutal a change as last year, when daytime highs were held to the upper 30s and 40s for a couple weeks. But it is a change worth noting. Yet I don't see a complete change to below-average temperatures, through the middle of December. The Climate Prediction Center, computer models, and private meteorological services seem to indicate that, on average, temperatures will be about average. A few cold snaps, lasting two or three days, are likely. But an abrupt change to mid-winter conditions does not appear in the offing for a while. Between now and the start of 2012, many of us in the Carolinas will hit the road for a visit with friends and family members. This is a tricky time of year to travel. Storm systems occasionally move across the South. They can produce a drenching, soaking rain that last for many hours, or sometimes they trigger rounds of showers and even severe thunderstorms (such as last week). Dense fog can be a problem. And as we progress deeper into the holiday season, the possibility of snow and ice rears its ugly head. 1. Interstate 77 at the N.C.-Virginia line: This is more than a pain in the neck. It's downright scary at times. The biggest problem is fog, but high winds and ice or snow also can provide the danger. It's a stretch of about 10 miles that climbs more than 2,000 feet. Once, about 30 years ago, I was in a northbound car that struck a large rock. The rock had tumbled into the road during heavy rain, and we didn't see it until the last minute because of fog. It damaged our steering system. But there have been fatal crashes on this part of the road during fog events. 2. Interstate 26, in Henderson County: Once again, an altitude climb creates conditions that can lead to dense fog or icing. Four people died in a multi-vehicle wreck in October 2010 in this area, and I-26 is closed frequently during winter storms in Henderson County because of ice and snow. A large number of trucks use this road, and the combination of trucks, cars and fog sometimes is not good. 3. Interstate 40, at Black Mountain: A familiar theme here. There's a 6% elevation grade over a five-mile stretch of roadway, and it's been the scene of some nasty wrecks in the past. If you're eastbound (going downhill), test your brakes before you start. Because of the altitude climb, wet roads at the bottom of the climb can be icy at the top. 4. West Virginia Turnpike, Bluefield-Beckley portion: There's an altitude climb around mile marker 25, but the bigger problem here is icing in the winter. West Virginia road crews do a good job of staying on top of conditions, but if you're headed north and a cold rain or even snow is falling in Bluefield, be prepared for worse conditions ahead. And consider making a rest stop at the big turnpike center near Beckley, because the portion of the road from there to Charleston is twisting and yet another headache. 5. Interstate 85, Greensboro to Durham: There are no altitude issues here -- just tons of traffic. And when heavy rain is falling, be careful. A number of times in recent years, traffic during the Thanksgiving or Christmas holiday weekends has been brought to a standstill by a multi-vehicle collision. 6. Interstate 81, various areas between Roanoke and Harrisonburg: One problem is I-81 has only two lanes in both directions, except for a few places near larger cities. The second problem is that half the population of the United States seems to travel this interstate highway on holidays or summer weekends. Oh, yeah -- and some of the people who drive on I-81 seem a bit reckless. Add bad winter weather to all this, and you have the makings of a travel nightmare. It happens from time to time. In all these cases, the various states' transportation departments have toll-free information lines, Facebook and Twitter accounts, and other ways of informing the public about wrecks and bad weather. Before leaving home, make sure you have a way of being alerted in advance. Having a difficult time figuring out whether to pack the warm-weather clothes away ... or deciding exactly what to wear each day? Our weather pattern is a see-saw affair, switching from late-autumn to early-autumn conditions every few days. And we're about to go into another dip -- followed, naturally, but another climb. This pattern is something you'd expect at the time of year when things are about to change in a big way. Autumn will give way to winter soon, and what we're seeing now is a sort of back-and-forth of seasons. We have a few mild days, and then the temperature tumbles for another two or three days. I got an email from Mecklenburg County commissioner Bill James, who noted that the current pattern is a working definition of Indian summer, and he's right. The traditional definition of "Indian summer" is a period of mild weather after a hard freeze. We've had freezing weather twice in recent weeks, and milder periods followed those freezes. Temperatures today are expected to reach the middle 70s, with lower 70s again Wednesday as a cold front approaches the area. Then we fall, with highs in the lower 60s Thursday and the lower 50s Friday. Then it's back up again, with 60 degrees Saturday, the upper 60s Sunday, and then the lower 70s Monday. How about cold weather for Thanksgiving (I saw one forecast of rain and a high of 42 degrees), followed by much warmer conditions on Thanksgiving weekend ... followed by (sigh!) a return to cold in the week after Thanksgiving. Some meteorologists have predicted this back-and-forth pattern is what we can expect for much of the winter. Typically, though, we settle into more prolonged periods of cold and then mild temperatures. Don't look for consistent weather this week. We'll have two very different air masses, starting with very mild conditions early in the week but ending with below-average temperatures. In between, there will be a rainy transition day. Most people will like the way the week starts. Mild air will be in control today and Tuesday, with a light southwest breeze and temperatures reaching 70 degrees today. Highs on Tuesday will be in the lower 70s, or nearly 10 degrees above average. Changes will begin to take place Wednesday, as a cold front approaches. Showers and possible a thundershower are expected to move into the area, although it appears as if the precipitation might not arrive until mid to late afternoon. It will be mild once again, with high temperatures in the low to mid 70s. Much cooler conditions will spread into the region Thursday, with highs probably only reaching the mid 50s -- despite sunny skies. It might be even cooler Friday, with sunshine and highs only in the lower 50s. A warm-up will begin Saturday, and at this point, the coming weekend promises to be very nice for the middle to end of November. High temperatures by Sunday will be back above average, possibly in the mid to upper 60s. Imagine a hurricane with snow! Alaska has some of the most amazing weather in the world, although I much prefer to marvel at it from afar. It's a place where temperatures reach 90 degrees in the summer and 45 below zero a few months later. And some of the storm systems that affect the state are incredible. Case in point: the storm that is expected to pound the western part of Alaska on Tuesday. If you watched the Discovery Channel's "Deadliest Catch," you know what I mean. Storms repeatedly batter the Bering Sea and the far northern Pacific Ocean throughout the year, but especially from autumn into winter. Those lobster boat crews battle hurricane-force winds and mountainous seas. I notice that the Weather Channel is launching a somewhat-similar series Wednesday night, with its "Coast Guard Alaska." A Hurricane Force Wind Warning is in effect for the western coast of the state for Tuesday and Tuesday night, and where the storm is predicted to make landfall -- around Nome -- there's also a blizzard warning. The low pressure system is expected to have a central pressure of 944 mb when it makes landfall. That's the equivalent of a Category 3 hurricane. Winds in the western Aleutians, from the islands of Attu to Kiska, are forecast to be 75 to 80 mph Tuesday, with waves of 30 feet. In Nome, the forest is for 4 to 8 inches of snow and winds of 60 mph. Temperatures will be in the 20s while all this is happening. The forecast for the town of Gambell -- on St. Lawrence Island, off the Alaskan west coast -- is for 75 mph winds and a mix of snow, rain and fog, with temperatures around 30 degrees. How can you have fog with winds of 75 mph? The weather here in the Carolinas should be very quiet this week. I prefer "quiet" to 75 mph winds, snow and fog. How good are our winter forecasts? I've written several stories, and you've undoubtedly seen several predictions about winter 2011-2012. It always makes great conversation, and meteorologists' ability to predict an upcoming season has improved mightily in recent years. But will we ever be able to really get the winter forecast right? It wasn't long ago that the Farmers' Almanac, the woolly worm and the groundhog were all we had to forecast winter. Then along came vast improvements in computer modeling and scientists' understanding of the various factors that create weather, and that gave winter forecasts a bit more clout. Still, there are some obstacles. Last October and November, all the talk was about La Nina, and what it would mean for winter in the South. The standard thinking is that La Nina means dry and mild winters in the South. Lo and behold, arctic air blasted into the South on Dec. 2 last year, and for 11 weeks, the eastern two-thirds of the United States shivered. Snow fell several times in the South. Charlotte got its first Christmas snowfall in a half-century, and December 2010 was among the coldest months in recent years. Some meteorologists had warned us that there were other factors in winter weather -- specifically, the Arctic Oscillation (AO) or North Atlantic Oscillation (NAO). When high pressure builds near the arctic, low pressure tends to form at middle latitudes (i.e., the United States). That sends arctic air blasting into the United States, and it also provides a nice little track for storms to form. It's why there was a series of winter storms last year from Texas to the Southeast coast, and then up the East Coast into New England. It was what meteorologists call a Negative NAO. Around Valentine's Day, the Negative flow went Positive, and La Nina took over. The weather got mild, and in late winter and early spring, the track of storms went across the South. That led to the series of tornado outbreaks that killed hundreds. The question is: Can we predict a Negative NAO or AO? "Right now, it's really not something we can forecast more than about a week in advance," said Mike Halpert, deputy director of the Climate Prediction Center for NOAA since 2007. "It's the fly in the ointment for our winter weather forecast." Halpert said that if scientists knew the NAO would be neutral or positive, then they'd forecast a mild, dry winter for the Southeast, due to La Nina. Instead, the prediction is for "an equal chance" or above-average or below-average temperatures. As you might expect, scientists are working hard to improve their ability to forecast the Arctic and North Atlantic oscillations. There are theories, Halpert says. One links the amount of snow in Siberia in October and November. More snow means colder air and higher pressure near the Arctic -- hence, a Negative AO. Halpert says another theory links the oscillation to the amount of sea ice or to sea water temperatures in northern latitudes. "We're looking at the research," he says. "This is an area of study for us." Some meteorologists, like Brad Panovich at WCNC, the Observer's news partner, have predicted this winter will have a similar pattern to last year -- a very chilly start, especially in December and early January. Then the indication is for a milder trend later in the winter, followed by the possibility of another bad tornado season in early 2012. This AO and NAO situation is a reminder that meteorology is a science, but one in which there are still many questions without answers. A rather vigorous low pressure system is expected to swing across the Carolinas later tonight and early Friday, and it will mean a rainy overnight period. The rain might extend into the early part of Friday morning's commute. But if your weekend plans include some outdoor activities -- football, for example -- the rain should be long-gone before the first kickoff. It will be chilly, however, and it could be breezy for the high school games Friday night. The low pressure system predicted to move eastward -- somewhere near the N.C.-S.C. line -- overnight is rather interesting. The computer models hint that moist air will surge into the area near the center of the low overnight. Coupled with rising air near the low, that could trigger a few overnight thunderstorms. At this time of year, overnight storms that form near strong low pressure systems need to be watched. Either way, a good drenching is likely tonight, and most areas will get a half-inch or more. The rain should end by mid-morning Friday, and a few peeks of sunshine are possible before sunset. Don't look for temperatures to climb much Friday, after overnight lows in the lower 50s. Highs probably won't get much above the mid 50s. Saturday and Sunday look to be mostly clear and cool, with daytime highs in the upper 50s and lows in the mid 30s. It's too early for THIS! Forecasters still expect rain to develop tonight, and for Saturday to dawn with cold, rainy conditions before the sun returns at midday. But no matter how bad our weather seems tonight and Saturday morning, we're catching a break. The low pressure system forecast to form off the Carolinas and move up the East Coast is predicted to bring heavy snow -- yes, heavy snow -- to parts of the Mid Atlantic and Northeast. It's only Oct. 28, for crying out loud! It's too early for this. Sure, the record books show a number of late-October storms along the East Coast, but it's been several decades since anything like this happened. Several cities in a path from northern Virginia to New England are forecast to get between 6 and 10 inches of snow, and an inch or two is expected to accumulate on grassy areas even in major cities like Baltimore, Philadelphia, New York and Boston. Places in line for the really heavy snow include Frederick, Md. ; Scranton, Pa.; and Hartford. This will be a heavy wet snow, accompanied by strong winds. In fact, a high wind watch is posted for Boston, where gust of 50 to 60 mph are possible Sunday. So the combination of wet snow and high winds will create a threat of downed trees and widespread power outages. Like I said ... we're getting off easy this time. The big picture responsible for this storm is the same old story ... a trough over the eastern United States. That trough is the reason why tropical storms were steered away from the U.S. mainland this summer, and it was a big player in our weather during the first two months last winter. The trough creates a steering current that brings cold air into the East, and storms tend to form on the edge of the trough path, along the coast. It ought to be interesting to check out the field conditions Saturday for a couple of college football games, like Fordham-Army, where a foot of snow is expected; and West Virginia-Rutgers, where it will be rain, but with 35 mph winds. A low pressure system centered near the Yucatan Peninsula of Mexico could become a tropical storm today and almost certainly will bring very wet, raw weather to parts of the U.S. East Coast this week. Meteorologists think the system eventually will merge with a strong cold front expected to cross the eastern United States late Tuesday and Wednesday, but the timing of any merger is still uncertain. Any link-up between the tropical low and the cold front apparently won't happen until after the front has moved east of the Charlotte area, so it will be the coastal Carolinas -- not the Piedmont -- that feels the brunt of the rain. On Monday morning, the National Hurricane Center said it still had not found and closed circulation in the low. The Hurricane Center is sending a reconnaissance jet into the storm this afternoon, however, and that could change things. Buoys and reporting stations in northeast Mexico, western Cuba, and the Florida Keys were reporting heavy rain and gusty winds Monday morning. It would form in the northeast Gulf of Mexico, then make landfall late Tuesday or Wednesday morning on Florida's Gulf coast, perhaps near Tampa. Top sustained winds are expected to be in the range of 50 or 60 mph. After that, Rina would cross Florida and then head up the East Coast, bringing several inches of rain and gusty winds to coastal Georgia, South Carolina, North Carolina, Virginia, Maryland and Delaware. Eventually, the storm would move up the Mid-Atlantic and New England coasts. Great weekend ... then some crazy changes! We're in store for a near-perfect weekend of weather in the Charlotte region and across the Carolinas. But we'd better enjoy it, because next week looks to be full of some wild swings ... some sun, some storms, some summer, some late fall. High pressure will take care of things nicely through Sunday. Windy conditions could cause some problems for boaters today, but forecasters expect the stiff west breeze to abate this evening. The rest of the weekend is predicted to be calm. Skies will be clear through the weekend, and with low humidity levels, the visibility will be great. That means sunshine during the day, deep blue skies, and a bright moon and stars at night. High temperatures are forecast to reach the low or mid 70s today and Saturday, and then the upper 70s Sunday. Tonight -- high school football and the NASCAR Nationwide Series race at the speedway: Temperatures will be in the mid 60s at 7:30 p.m., dropping to the upper 50s by the end of the games and race. Saturday morning (soccer, golf, tennis, festivals, whatever): Look for temperatures in the upper 40s at daybreak, climbing rapidly through the 50s and 60s. It'll be near 65 degrees by noon. Clear skies. Saturday afternoon college football and other activities: Temperatures in the low 70s and full sunshine. Saturday night's Bank of America 500: It could get a bit chilly. Look for temperatures around 62 to 64 degrees at 7:30 p.m., falling into the low to mid 50s by the end of the race. Sunday: It'll be the coolest morning of the weekend, with temperatures in the low to mid 40s at daybreak. But there'll be a quick rebound, with highs soaring to the upper 70s in the afternoon. A taste of summer: Monday could turn out to be the warmest day in weeks. Skies will be partly to mostly sunny, and highs will be at least 80 degrees, according to the National Weather Service. Accu-Weather, the Pennsylvania-based private company, is forecasting highs possibly approaching the record high of 85. Stormy weather? A strong cold front will cross the area late Tuesday or Wednesday, and the computer models are touting the development of low pressure somewhere in the Carolinas. That raises the spectre of a severe weather outbreak on the southeast side of the low. Forecasters will be watching this over the weekend. Adios, warm weather! Some really chilly conditions will spread into the Carolinas late next week. This is seven days out, so things could change a lot by then. But if everything pans out, we could be looking at highs in the upper 50s and low 60s next weekend. Hurricane Irene has disappeared from the headlines, but more than six weeks after the storm battered the eastern third of North Carolina, the damage can still be seen in some places. Some amazing work by engineers and crews allowed for the reopening of washed-out N.C. 12 at the southern end of the Outer Banks earlier this week, but the N.C. Department of Transportation says its crews still have a lot of clean-up ahead. I talked last week to someone who has been in mainland Hyde and Craven counties in the past 10 days, and he told me that downed trees, limbs and other debris are still a common sight. The DOT's crews have been working long hours since late August to clean the mess, and they've picked up 55,000 tons of trees and limbs since then. The clean-up is finished or nearly complete in eight counties, but it will be several more weeks before the trees and other debris are hauled away in 28 other counties heavily affected by the hurricane. The N.C. 12 repairs involved around-the-clock work. Three breaches were repaired between Oregon Inlet and Rodanthe, but the most amazing job was the speedy installation of a modular bridge at the worst hurricane breech, about six miles south of Oregon Inlet. The bridge is narrow, and the speed limit is 25 mph. But engineers say it is sturdy enough to absorb a pounding from winter nor'easters until something permanent can be designed. And while we're speaking of clean-up ... one of my sons was in Lee County about two weeks ago and said the damage is still visible from the killer tornadoes that roared through Sanford (and many other places in eastern North Carolina) on April 16. It will be years before Nature is able to repair the damage caused by those mid-April storms. One of these days, I'll learn my lesson about precipitation totals. Yet again, a low pressure system has failed to deliver the rainfall predicted by most (but not all) computer models, and I believed the wrong computer forecasts. While rainfall has been widespread across the Charlotte region today, it has been mostly light. The National Weather Service was forecasting at midday Monday that between 1 and 2 inches would fall in the Charlotte area today and tonight. But the low pressure system that dumped 10 inches of rain on parts of Florida never got its act together as it moved northward. Much of the rainfall evaporated as it encountered the very dry air in place across the Piedmont for the past week or so, and by early afternoon Tuesday, about one-third of an inch has fallen at Charlotte/Douglas International Airport. That's about the same total on my home rain gauge. It's a far cry from 1 to 2 inches. Faulty precipitation totals are a nuisance, and they're more of a problem in the winter, when forecasters are trying to predict how much ice or snow will fall. Often, thunderstorms erupt along the Gulf Coast and rob the moisture from the Carolinas and Georgia. That wasn't the case this time. Instead, low pressure never really strengthened like it was forecast to do. I'm a big believer in patterns and trends, and clearly the pattern now is for dry weather. Another low pressure system is forecast to cross the area Thursday, accompanying a weak cold front. The computers are indicating showers and thunderstorms will break out. But if you're relying on rain Thursday to water your newly seeded and fertilized lawn, I'd remember what happened today. Low pressure moving northward from the Gulf of Mexico and Florida will put an end to the nearly two-week string of dry days in the Charlotte region. Rain will move into the area this evening or overnight, and it will continue intermittently until Wednesday morning. By the time the last showers have pushed northeast of the region sometime later Wednesday, much of the area could get 1.5 or even 2 inches of rain. The low pressure system is being fed by tropical moisture, and it will bring breezy conditions to the Charlotte region Tuesday. Temperatures probably will fall from the mid 60s in the morning, dropping to near 60 degrees for much of the day. In short, we're looking at a raw day. There won't be a worry about severe weather, however -- this will be what meteorologists call a "stratiform" rain event. That's a nice way of saying low clouds and a mostly steady rainfall. Flooding isn't likely, either, because the precipitation will be spread over a 36-hour period. Besides, it has been very dry in the area since late September. Once the rain departs later Wednesday, we're looking at dry and mild weather for the end of the week. A real autumn air mass will roll into our region this weekend, and at some point Saturday or Sunday, you'll think about winter. Hopefully, you won't think too much about winter, because we have a lot of beautiful fall weather ahead before the next season change. But if the thought crosses your mind about winter 2011-12, here's the answer ... it looks like a mixed bag again this year, much like last winter. And some meteorologists say our upcoming winter could more closely resemble 2008-09, which was among the craziest winters we've experienced in a long time. First, a review of last winter -- 2 1/2 months of nasty, cold and sometimes wet weather; followed by one month of an early spring. The same players are here again this year. La Nina has reappeared, after disappearing late in the spring. La Nina is a condition of colder-than-average waters in the eastern Pacific, and it usually translates into dry, mild weather for the southern tier of the United States. It also was blamed in part for the tornado outbreak last spring, but let's focus on winter for now. If La Nina were the only condition of importance, we'd be looking for a dry and mild winter. But another key factor, as we learned last year, is the North Atlantic Oscillation, or NAO. That condition describes the overall path of the jet stream in the upper ranges of the Northern Hemisphere. When the NAO is negative, as it was for the first two-thirds of last winter, it means cold air masses and occasional storm systems dive from the arctic into the eastern United States (and also into Great Britain and northern Europe, on the other end of the stream). Last December and January were very cold months, and there were notable winter storms on Christmas Day and again Jan. 9-10. We had a few other close calls on winter storms, and the Mid-Atlantic got hammered. Then, like someone flicked a switch, the NAO relaxed around Valentine's Day. La Nina took stronger control, and high pressure built over Texas. We had warm weather and mostly dry conditions from mid-February into much of March. -- December was mild. It reached 67 degrees on Christmas. -- January and February featured wild swings. It dropped to 9 degrees on Jan. 17 but hit 60 or higher six days. Feb. 5's low was 13, but it climbed to 71 degrees just two days later. -- Then came March. A strong winter storm struck on the 1st. After dumping nearly 2 inches of rain and causing flooding, the precipitation changed to snow that Sunday evening, and we got 4 inches in Charlotte (the only measurable snow of the winter). A foot fell near Shelby. Then, less than a week later, it was 80 degrees. In fact, we had six days of 70 or warmer in the first part of the month. We'll fine-tune the forecast in weeks to come, but this will give you something to think about as you break out the sweaters and jackets this weekend. I'd planned to write today about the coming winter's weather, but there'll be another day for that. Instead, today's topic is a person whose work you had read for years in the Observer, but you never saw his name. I don't know if he considered himself a weather geek, but I did. For true weather geeks, that's not a title we hand anybody. It's earned. I came to the Observer more than 33 years ago, and a year or two after I arrived, I realized we'd hired a clerk named Joe Sovacool. The term "clerk" doesn't describe everything he did. Basically, Joe managed the Newsroom. He shuffled phone calls to the right people, answered the phones and received thousands of tips from the public, passed those tips to reporters, and did dozens of other things. He knew a lot about the Charlotte region and a lot about the journalism business. If a reporter or editor asked him for advice, they'd get a good, sound answer. Joe also handled the Observer's weather page. A lot of the information we publish on that page comes to us automatically, but it wasn't that way 20 or 25 years ago. We had a weather wire machine, and Joe accumulated and compiled the high and low temperatures, forecasts, tide information and everything else on the page. Somewhere along the way, I discovered Joe actually enjoyed meteorology. He understood the peculiarities of Carolinas weather, and he taught me a few things over the years. About a decade ago, when I started writing about the weather, I would run ideas past him. We'd talk about a topic -- an approaching storm, a dry spell, memorable snowfalls. "Are you gonna write about it?" he'd ask. Joe cared about that weather page. It was merely one of many things he did, but he took this whole journalism accuracy thing seriously. He knew people looked for temperature information and when high tide was coming. Back in September 1989, when I was working in our Monroe bureau, I called Joe to talk about Hurricane Hugo, which was then near Puerto Rico. We agreed that Hugo seemed headed for the Carolinas, and we talked about the possibility that it might affect Charlotte. "Are you gonna write about it?" he asked. I didn't. Back then, I wasn't a weather writer. Joe died Thursday evening, and all of us at the Observer -- whether we've been there one year or 33 -- will miss his friendship. To me, he's the Observer's real Weather Guy. And this time, I'm writing about it. It's like someone sprayed a can of storm repellent on the United States mainland this weekend, and the result for those of us in the Carolinas will be the nicest Saturday-Sunday combination we've had in quite a while. If you're headed for any of the festivals in the area (the Greek Festival and the Blues & BBQ event are Charlotte's highlights), you'll have great weather. The same is true for anyone headed to a football game this weekend. There are three tropical weather systems in the Atlantic/Caribbean basin, but none of them figure to bring us much trouble either. High pressure will dominate the Carolinas for several days, and the stubborn storm system -- the remnants of Tropical Storm Lee -- that caused serious flooding in parts of the East has moved away. That system spun clouds into the Charlotte region Wednesday and Thursday, but sunshine has taken control today. That will continue into next week. With more sun, high temperatures will return to the low 80s today, then the mid 80s over the weekend. Morning lows will be near 60. Folks, it doesn't get much better than that in September. It looks as if the upper 80s will return by later next week. The computers continue to hint at a real cool down next weekend (think, highs in the mid 70s), followed by a return to 90-degree weather by Sept. 20 or so. Katia -- This system is losing its tropical characteristics as it moves into cooler water in the North Atlantic. It looks like Katia will plow into Scotland early Sunday with sustained winds of 70 mph and stronger gusts. That'll be a very stormy day in the northern part of the British Isles. Maria -- It was a weak tropical storm Friday morning, but the National Hurricane Center expects Maria to get stronger over the next two days, possibly reaching low-level hurricane status. Maria will bring strong winds and rain to the northern Antilles (Guadeloupe and St. Martin, for example) and then the Virgin Islands. After that, Maria will do what most other hurricanes have done this year in the Atlantic -- curve away from the U.S. coast. A strong trough continues to dominate conditions along the East Coast, and it has provided the United States with hurricane insurance this year, with the notable exception of Irene. High waves and rip currents will be a problem along the Outer Banks, however, due to Maria. Nate -- This tropical storm is forecast to grow into a hurricane. It's in the Bay of Campeche, in the southern part of the Gulf of Mexico. Hurricane specialists expect it to make landfall in central Mexico later this weekend. It will have no impact on the United States. It really seemed like autumn arrived in the Charlotte region today, with the morning low dropping to 59 degrees, and temperatures only recovering into the lower 70s by mid-afternoon. Cool weather is expected to continue for several days, with highs near 80 and lows in the upper 50s. And it's a dry air mass, not the artificially-cooled situations we sometimes get when the humidity is sky-high and the only reason why temperatures have dropped is because of thick clouds. No, this really is a taste of autumn, thanks to low pressure over the eastern United States that is dragging Canadian air southward. But the computers say it won't last. Actually, we didn't need the computers. The calendar and common sense could have told us that. It's September 7, and history shows there are still some hot days ahead. Sure enough, the latest computer models predict a return of much warmer conditions by next Tuesday. Highs in the middle of next week are predicted to be in the upper 80s to near 90 degrees. The computers show plenty of really warm weather into the last week of September, in fact. So enjoy the next few days, and pretend that autumn has arrived. But when summer returns next week, you should be prepared. Busy Tropics: As of 2:30 p.m. Wednesday, we have three systems in the Atlantic/Caribbean basin. Hurricane Katia is bound for the North Atlantic, never to bother a land mass in the Western Hemisphere. It was steered away from the United States by a low pressure trough over the East Coast -- as has been the case, in large part, for about three years. The other two systems are Tropical Storm Maria, which is in the eastern Atlantic, and Invest 96F, a cluster of thunderstorms in the Bay of Campeche, off the Gulf of Mexico. The computers haven't agreed on the future track of either system, but their paths might be related -- just as Tropical Storm Lee's northeast push pushed Katia away from the U.S. coast. If 96F, which is expected to become a tropical storm soon, moves northward into the Gulf Coast, it would deepen the trough along the eastern United States shore and steer Maria away from the coast. That's what some computer models are predicting. By the way, that would leave open the possibility of 96F (which would be named Nate) copying Lee and bringing heavy storms into the western Carolinas. But that's a long ways down the road. Now, if 96F should move westward into Mexico (which is what most models forecast), then it leaves the door open for Maria to stay on a westerly track past the Caribbean islands and toward the Florida or Georgia coast. The overwhelming trend this year -- and in 2008, 2009 and 2010 -- has been for Atlantic hurricanes to curve away from the Southeast coast. And that's probably what will happen with Maria. But there are some interesting possibilities to watch in coming days. Hurricane Katia ... oops, Tropical Storm Katia (it's swung back and forth several times in recent days) has proven to be a real mess for the National Hurricane Center's meteorologists. Both the storm's intensity and track have proven nearly impossible to predict, and the 5 p.m. update from the National Hurricane Center reinforces that. Meteorologist Daniel Brown said it "cannot be stressed enough that there is considerable uncertainty in the track forecast." Brown noted -- as have other meteorologists -- that the evolution and future path of Tropical Storm Lee will have a great deal to do with whether Katia curves away from the U.S. coast or plows into the mainland later next week. For days, computer models have predicted the storm would curve into the open Atlantic. But the models also have waffled on the forecast. Some models that once predicted a recurve are now hinting that Katia -- currently heading northwest and far from any land mass -- might switch to a westerly track in several days, making a beeline for the U.S. coast. And some models that initially brought the storm close to shore have switched to a recurve solution. If Tropical Storm Lee moves northeast in the next few days, as predicted, it will serve to "catch" Hurricane Katia and curve it northward, away from the U.S. coast. But the winds steering Lee are extremely light, and forecasters aren't certain when it will move. And if all that isn't enough, the National Hurricane Center has struck out in trying to predict Katia's intensity. Forecasters predicted a couple days ago that Katia would be a major hurricane by now. Instead, its top sustained winds were only 70 mph Saturday evening. It's a mess, and it will be another few days before we can say with certainty that the East Coast is safe. Hurricane Katia will make this a very nerve-wracking and interesting weekend for amateur and professional meteorologists -- and for authorities along the East Coast of the United States. For days, the computer models insisted that Katia would become a major hurricane and curve northward, never coming close to the United States. If any land mass would be threatened, it would be Bermuda. That has changed considerably over the past 24 or 36 hours. And Jeff Masters, a really outstanding meteorologist with plenty of tropical forecasting experience, says Katia's future might depend a lot on a tropical storm predicted to hit Japan this weekend. Many of the computer models show a slow-moving but strong Hurricane Katia moving northwest for a few days, but then veering westward toward the Carolinas coast. That westward turn depends on the strength of a trough (low pressure) along the U.S. East Coast. A deep trough would recurve Katia away from the United States. A not-so-weak trough would allow high pressure in the Atlantic to strengthen. And the clockwise flow around the high would push Katia into the East Coast. So what about the Japanese storm? Tropical Storm Talas is expected to move into Japan on Saturday morning, then convert to a non-tropical storm -- and a very strong one -- in the Gulf of Alaska. That Gulf of Alaska storm is predicted to have a ripple effect on smaller storm systems downstream -- across Canada and into the United States, including the trough in the East. If Talas becomes a very strong storm, the thinking is that it will deepen the trough in the East and push Katia away from the United States. A weaker Alaskan low, and Katia could push toward the United States. You can read Masters' blog at http://bit.ly/qyN9qh. Katia wouldn't threaten land until the end of next week. But its waves and rip currents could be felt along the Outer Banks and possibly the Grand Strand by Labor Day. As we said, this will be an interesting weekend. The last thing that anyone on the Outer Banks wants is another visit from a hurricane. The tropics are certainly back in business for meteorologists, with a hurricane moving westward in the Atlantic and another system trying to form in the Gulf of Mexico. The next several days will be extremely interesting for meteorologists and other weather-watchers, because the computer models can't figure out what to make of the situation. There is a chance that the Charlotte region could be affected by either -- or neither -- of the two systems. Hurricane Katia is out there -- way out there -- in the Atlantic. The coordinates at midday Wednesday were 15.5 degrees North and 47.5 degrees West, and the storm was moving westward at 18 mph with 75 mph winds. Don't look for much strengthening in the next day or two, because the storm is encountering dry air and some shear. But Katia is forecast to intensify by late Friday or Saturday and eventually become a major hurricane. The other system is a cluster of showers and thunderstorms in the Gulf of Mexico, south of Louisiana. Most computer models predict it will become Lee (probably as a tropical storm, not a hurricane), but the computers take the storm all over the place -- westward to near Brownsville, Texas; north into Texas or Louisiana; or even eastward into Alabama or western Florida. The Gulf low could bring heavy rain to the Charlotte area, perhaps as early as Labor Day but probably later next week. To do that, it would have to come ashore and link with an approaching cold front. That looked likely in yesterday's computer model runs, but less so today (Wednesday). As for Katia ... who knows? For several days, the computers predicted the hurricane would curve northward, becoming a threat to Bermuda. But in the last 24 hours, the computers are predicting that a trough (low pressure) forecast to drop into the eastern United States will be weaker than first expected. That trough -- located between high pressure over Texas and another system in the Atlantic -- was expected to allow Katia to curve northward. But if the trough is weak, the Atlantic high pressure system could steer Katia toward the U.S. coast. And to make things even more complicated, the Gulf storm system also could have an impact on Katia's track, by helping steer it northward -- if the Gulf low becomes strong enough, and if it moves eastward. I think the Gulf system will have more of an impact on our lives, but we'll have to keep watching closely over the next few days. Why does the path keep moving east? Forecasters were talking Sunday about Hurricane Irene slamming into south Florida. By Monday morning, it was north Florida. Later in the day, it was Charleston, and then Myrtle Beach. Tuesday morning, it was Wilmington, then Morehead City. Now it looks like the Outer Banks -- or maybe not at all. The continued eastward adjustment of Irene's predicted path has frustrated those responsible for planning emergency preparedness, although I'm sure nobody in south Florida is complaining about not being hit by a big hurricane. But why the continued adjustments? For starters, forecasting the path of a hurricane is not an exact science. You already knew that. Fifty years ago, meteorologists were hard-pressed to forecast the path 48 hours in advance. Now, they almost always get it right within 72 hours. It's the predictions beyond 72 hours that cause the problems. As you might know, the path depends on a lot of factors. In Hurricane Irene's case, the storm is expected to move into a weak area between two strong high pressure systems -- the "Death Ridge" over Texas (so named because it has been absolutely immovable this summer and has been death to any cold front or storm system that approaches), and the Bermuda high in the Atlantic. Frequently this summer, circulation around the eastern side of the Texas Death Ridge has sent cold fronts into the Southeast. That's why we've had a lot of rain this summer and a few episodes of below-average temperatures. That "weakness" between the two highs is called a trough, or a dip in the atmospheric flow. Hurricanes usually follow a path into such a weakness, and what happened with Irene is that computer models had a difficult time several days ago predicting how far south that trough would expand. Imagine the trough as a roller-coaster, with the low end of the ride along the East Coast. Small low pressure systems riding along that trough can help steer a hurricane up the right side of the trough's path -- northeast, away from the U.S. coast. Actually, we've seen this happen frequently in recent years. The last year I can remember when hurricanes barreled directly into the East Coast was 2004, when Frances and Jeanne pummeled Florida's Atlantic coast. Some meteorologists think that as long as the Texas Death Ridge is in place (and who knows when that will break down! ), the East Coast will have some built-in insurance against tropical storms and hurricanes. Bill Reed, director of the National Hurricane Center, said in a morning news conference Tuesday that it's been tough, predicting exactly when Hurricane Irene will get caught in the upper-level flow, forcing a turn to the north and eventually the northeast. He's still not certain about the path, saying it could move back to the west or to the east. I'm betting the east, because of the old weather saying, "The trend is your friend." And in Irene's case, the trend has been eastward. Hurricane Irene is leaving Puerto Rico and moving toward the north coast of the Dominican Republic on Monday morning, and while meteorologists now have a few more answers about the storm's future, there are still many questions. As of now, the National Hurricane Center's official forecast for Irene calls for it to have nearly 120 mph winds when it makes landfall early Saturday morning between Savannah and Charleston. Under that path, the remnants of Irene would have a major impact on the Charlotte area Saturday, with the threat of tornadoes and flooding rain, plus a chance of damaging winds. But that is merely one of many, many possible scenarios. 1. Irene is a hurricane, not a tropical storm. Its top sustained winds reached 75 mph overnight, while it crossed Puerto Rico. It's rather impressive that the storm strengthened despite crossing a land mass. 2. National Hurricane Center forecasters now think Irene will only graze the northern part of the Dominican Republic, rather than go over the center of the island of Hispaniola. This means the mountainous terrain of the island is not expected to affect the hurricane's circulation. And that means a stronger Irene down the road. Irene is predicted to move northwest, crossing the Bahamas as a hurricane. The computer models all agree with that. By Thursday, however, the forecasts get uncertain. A trough is expected to move into the eastern United States. If the trough is deep enough (far enough south) and strong enough, it could curve Irene back out to sea. In other words, the hurricane's track would look like the tee shot of your golfing buddy with a bad slice -- off to the right. And some computer models predict that. WBTV meteorologist Al Conklin noted that this morning, saying that trends mean a lot in forecasting. And the trend in the predicted path of Irene for the past 24 hours has been eastward. With each adjustment from the National Hurricane Center, the storm's forecast track has been nudged a little farther east. Conklin noted -- and he's right -- that when this happens, it tends to continue happening. If so, Irene could become an issue only for the Outer Banks. And should that happen, Charlotte and the rest of the Piedmont would get no impact from the storm. But to be fair, it's also important to note that a few computer models actually show the storm moving farther west than the Hurricane Center's predicted path -- into south Florida and then up through Georgia and the western Carolinas. Joe Bastardi, a former Accu-Weather meteorologist now with Weather Bell, is predicting landfall in the Carolinas, perhaps near Charleston or Myrtle Beach. Larry Cosgrove, another private meteorologist with a big following, is pointing toward Myrtle Beach. And, he adds, "The hurricane will trigger almost biblical amounts of rain, with lots of wind, across parts of Appalachia and the entire eastern seaboard." Dan Kottlowski of Accu-Weather says, "A look at track forecasts suggests a higher chance of Irene tracking along or just off the coast of eastern Florida and making landfall along the Carolina coast." Something to note ... hurricanes almost never make landfall between Daytona Beach and Savannah. That's because of the curvature of the coast line. There are no major changes in thinking tonight about the future of Tropical Storm (and eventual hurricane) Irene. The National Hurricane Center's five-day forecast calls for Irene to pass near or over Puerto Rico tonight, then cross the northern part of the island of Hispaniola, before taking aim at the Bahamas and eventually Florida. The bottom line: Nearly every forecaster agrees that the Carolinas should pay close attention in coming days to Irene. At 8 p.m., the center of Tropical Storm Irene was at 17.8 degrees north and 64.9 degrees west. That's about 10 miles northwest of St. Croix, in the U.S. Virgin Islands; and 90 miles east-southeast of San Juan, Puerto Rico. Irene's top sustained winds were 60 mph, and the storm is expected to strengthen into a hurricane Monday before hitting the Dominican Republic, which occupies the eastern half of Hispaniola (Haiti is on the west). Hurricane warnings are in effect for Puerto Rico and the Dominican Republic, with tropical storm warnings posted for the Virgin Islands, Haiti and a few islands east of Puerto Rico. Tropical storm warnings also are in effect for the Turks and Caicos islands and for the southern Bahamas, with a tropical storm watch posted for the central Bahamas. The computer models on Sunday afternoon shifted the predicted path of the storm a bit east. Some of the models show it staying east of the Florida coast and then curving out to sea. One of the highest-regarded models, the European, shows a direct hit on the South Carolina coast (possibly as a strong hurricane). The National Hurricane Center is sticking with its forecast of a Florida landfall Thursday, and then the storm is predicted to move northward through Florida, headed for Georgia and the Carolinas. I'll repeat what I said this morning ... a lot depends on how much interaction Irene has with Hispaniola's mountains. If the storm passes directly over the island, it will be weakened considerably as it heads toward Florida or the Carolinas. If it stays north, then look out! Another player in this situation is a trough (weakness in the atmosphere) predicted for the East Coast late in the week. If the trough deepens and pushes a cold front south of the Carolinas, it could force Irene out to sea. If the trough is not that deep, then the Carolinas are in play. On Sunday evening, Irene is lashing the Virgin Islands. Very heavy rain is moving into Puerto Rico at 8 p.m. Sunday, and that island is in for a rough night. Throughout the day, I've been monitoring messages from amateur meteorologists in Puerto Rico. About an hour ago, one of the more reliable weather watchers messaged that the winds are picking up and electricity is flickering on and off. This could be a nerve-wracking week on the Southeast Coast. Anyone with an interest in meteorology is watching models today -- computer models. The future track and strength of what is now Tropical Storm Irene is of intense interest across the Southeast, as forecasters and weather geeks try to determine if Irene eventually will threaten the U.S. mainland -- and how much of a threat it will be. For the most part, the models agree on the track. They carry the storm near Puerto Rico, across the Dominican Republic, and then brushing (or missing) eastern Cuba, before heading toward the Bahamas and Florida. Most of the models predict Irene will move into southeast Florida or along the east coast of the Sunshine State. And after that? Will the storm curve back out to sea, or will it keep moving northward, on a collision course with coastal South Carolina? The short answer is that nobody knows. A trough will be setting up across the eastern United States by late in the week, when Irene approaches. How deep (how far south) will the trough extend? And will it get here before Irene does? It's too early to tell. And it's definitely too early to tell about Irene's strength. If the storm brushes the Dominican Republic and misses Cuba, it could be a major hurricane when it approaches the United States. But a direct assault on the Dominican Republic's 6,000-foot mountains could seriously weaken Irene, which is expected to be a hurricane when it reaches the island of Hispaniola. We do know this is the first threat of the year for the Caribbean and the United States, but it will be early or mid week before we have a better idea on Irene's strength and course. Well, that didn't take long! Less than an hour after writing that a tropical depression or storm could form this evening, the National Hurricane Center began issuing advisories on Tropical Storm Irene. At 8 p.m. Saturday, its ill-defined center was at 14.9 degrees North and 58.5 degrees West. That puts it about 200 miles east of Guadeloupe and Dominica. The storm has top sustained winds of 50 mph. Meteorologists say one key factor will play a huge role in whether Irene becomes a strong hurricane and whether it will directly impact the United States -- the track. The National Hurricane Center's initial track carries the storm over the island of Hispaniola (Dominican Republic and Haiti), and that's usually death for a tropical system. The mountains on that island tend to disrupt the circulation in a tropical system. What's left of Irene also would brush the north coast of Cuba, and the Hurricane Center's initial prediction shows a tropical storm -- not a hurricane -- approaching south Florida on Thursday afternoon. What everyone will be watching over the next 24 hours is exactly where the storm's center forms, and which direction it goes. If the center forms a bit north of where it is now, or if Irene tracks a bit farther north than expected, it would miss the big islands and have a clear aim at the Bahamas and the Southeast coast. The reverse is true -- a track farther south would carry the storm into the Gulf of Mexico. One thing is for sure -- Irene is a big storm, and Puerto Rico will take a pounding Sunday, with flooding rains and gusty winds. Beyond that, we shall see. Steve Lyttle says growing up in northeastern Ohio, with its foot-deep snows and summertime severe thunderstorms, fueled his interest in meteorology. He has written about weather for 10 years at The Observer. Join the discussion about weather trends and weird weather events -- whether local or around the world.